← Horse Meat for Human Consumption – Where do these Horses come from? 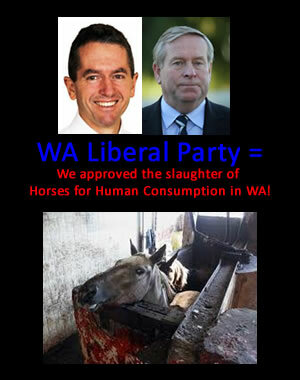 Let us know what impact the WA Liberal Party’s decision to approve the slaughter of horses for Human Consumption in WA and Australia, on your Vote in the State Election in 2013! Have Colin Barnett and Terry Redman and the Liberal Party in WA lost your vote? VOTE IN OUR POLL NOW! This entry was posted in News, Take Action! and tagged animal cruelty, animal welfare, colin barnett, horse meat, horse rescue, horse welfare, terry redman, w.a liberal party. Bookmark the permalink.